Want to know what pet coupons to expect in this Sunday’s newspaper coupon section? Check out our weekly Sunday Pet Coupon Preview to plan ahead, get organized and save money on pet supplies! This week, most papers will have 3 coupon inserts: 1 SmartSource, 1 RedPlum and 1 P&G. Check the list below for your favorite pet brands and if you want more coupons or don’t see what you are looking for, be sure to hit the online coupon database to find free printable coupons for groceries, pet food, cleaning products and more. Remember that coupons and values can vary by region or publication so always take a look inside before you buy the paper if you are purchasing it to get specific coupons. Time to give you the inside scoop on what pet coupons to expect in this Sunday’s newspaper coupon section. There’s only going to be 1 SmartSource coupon insert and not too many pet coupons this week, so I’m also including some free printable coupons that you might want to print and use on your next shopping trip. If you don’t see what you’re looking for, remember to also visit Coupons.com to browse the entire free coupon database for lots of printable pet and grocery coupons for your home and family. Click any of the links above to jump straight to the pet coupon you’d like to print or go HERE to browse for more free printable coupons! 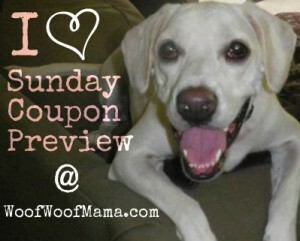 Wondering what pet coupons to watch for in the Sunday newspaper coupon section? Check out our preview and get organized to save time and money by planning ahead. There will be 2 RedPlum and 1 SmartSource coupon inserts in most major papers this week. Looks like it’s going to be a very BIG weekend for couponers with 3 coupon inserts expected in most Sunday newspapers! Check out our preview and get organized to save time and money by planning ahead. It’s time for our weekly Sunday Pet Coupon Preview to let you know what pet food coupons to expect in the Sunday newspapers. This week there is only 1 coupon insert in most papers, and since there aren’t very many pet coupons, I decided to also include a list of printable pet coupons you might like. Those of you who do get the Sunday newspaper, be sure to watch for the big $10 OFF $40+ Target coupon, good for Purina pet care items. Keep in mind that many other stores accept competitor’s coupons and will honor Target coupons, too! If you don’t see what you’re looking for below, remember to also visit Coupons.com to browse the entire free coupon database for lots of printable pet and grocery coupons for your home and family.